I have had this stack of color wheel fabrics for a couple years, with the intention of making the color wheel project in the Last Minute Patchwork Gifts book by Joelle Hoverson. After seeing a few other people blog about that endeavor, I decided it was a bigger project than I had time for. So I continued to savor this pretty stack. The first Dresden Plate block I made as part of the Sew,Mama,Sew quilting month gave me the idea to make this mini color wheel, using Elizabeth’s pattern. It’s not quite finished yet because I still have to quilt it, but I love it! It was so fun arranging and re-arranging the fabrics so they lined up as close as possible to my actual color wheel. I can’t wait to hang it on the wall in my sewing room for inspiration. 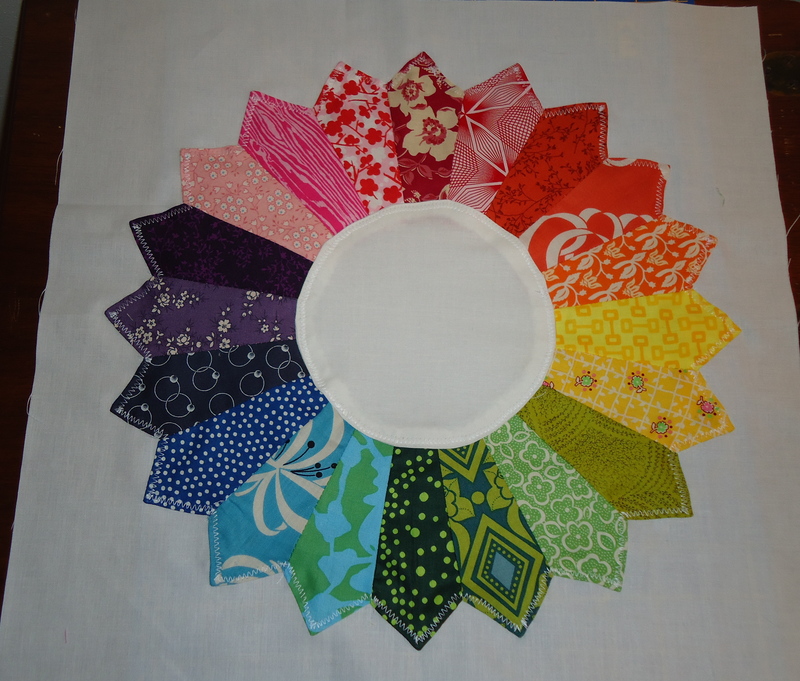 I still have so much fabric left for more color wheel projects, since my dresden plate only used a tiny piece of 20 colors. Spring has come early here, so our crab apple tree is in full bloom one month ahead of normal. It always reminds me of a giant flower, and it smells oh so good! 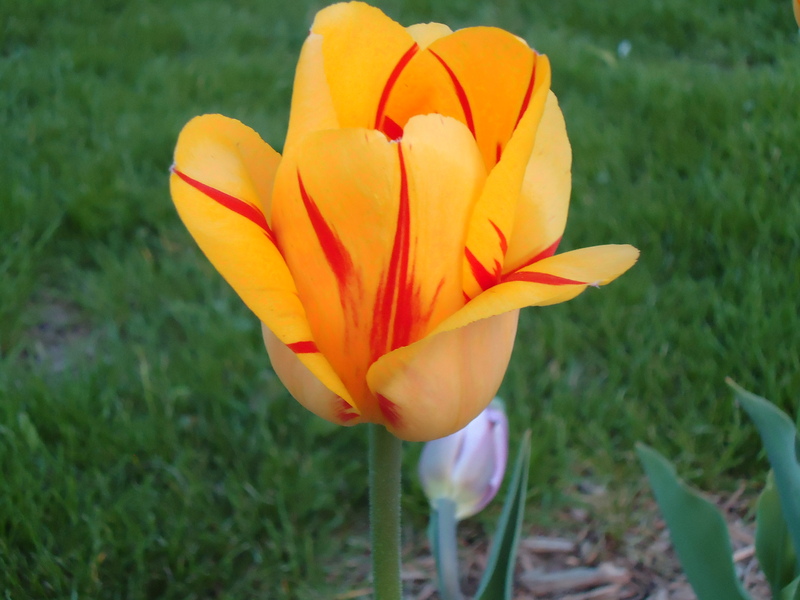 I am loving all the beautiful tulips blooming throughout our yard. 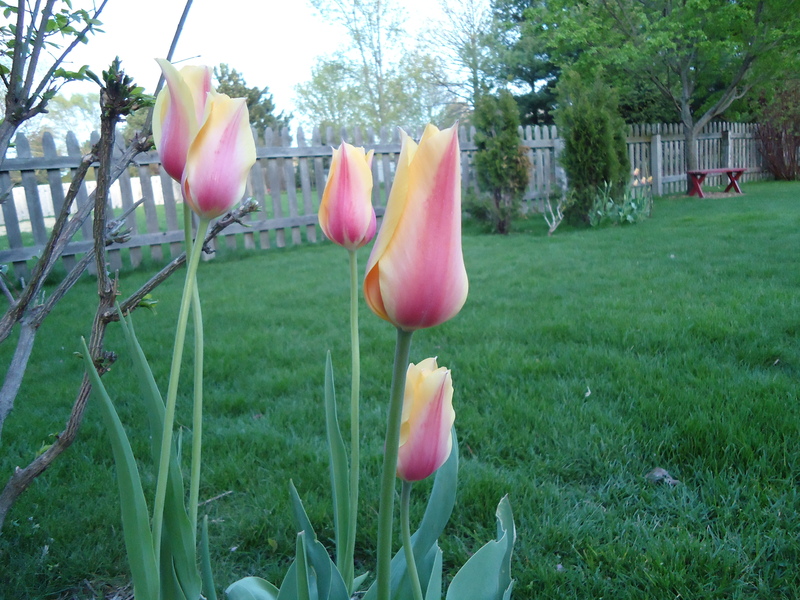 These blushing sunshine tulips are my all time favorites. Enjoy your weekend, my friends, whether you plan to do some sewing, gardening, or visiting the market (three of my personal favorites). Fantastic Terri – I have always wanted to try a dresden plate – your colour wheel version is stunning and very modern – love it! oh you are so clever. love the color wheel dresden plate! my color wheel quilt is cut and hanging on the wall..and hanging and hanging …. love all the pretty fabrics!! i just am making my first dresden plate, and am loving how fun they are. i also used elizabeth’s tutorial. 🙂 how fun!! Love all the colors there, and the dresden plate looks really good done with them all. Maybe a table runner made with them. Bright and beautiful. 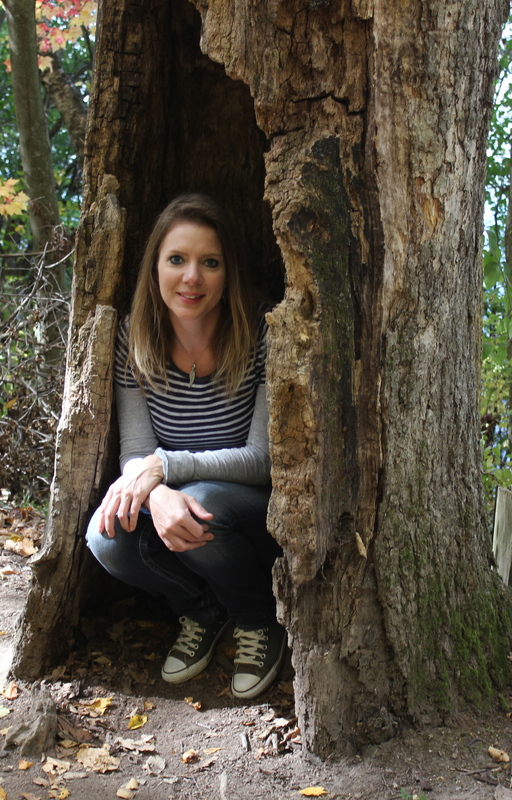 Love that tree. It is pretty in bloom. Hi Terri~Your yard looks beautiful! And I love your color wheel~it’s a definite sewing room necessity. Those are such gorgeous fabricsss ~ im drooling! I love your color wheel projects! Oh my your garden is soo pretty…loving that gorgeous tree so much and those lovely tulips! Such pretty color inspiration! Have a lovely merry happy weekend and love to you! That’s a pretty awesome stack of fabric! Love your dresden plate and your yard. Happy May Day! Such a pretty dresden plate! I keep meaning to make one-I’ll get there! I have to tell you, I’m not a flower person and I really, really love those tulips. They are so sweet and delicate, they’re one of those beautifully simple flowers, gorgeous all by itself! Your colour wheel block looks wonderful – the way each colour progresses into the next – my eyes fairly jumped out of my head at your beautiful fabric stash! So much delicious fabric. Hey Terri, I do like the idea of the colour wheel dresden plate. Just stunning. The blossom on the tree is just beautiful,I am sure the bees are in heaven. Just catching up with blogs been out in the garden pulling out more lavender. Thanks for the shots in the previous post of your sewing room.Have a great weekend. Oh my! I love your dresden and that stack of colorwheel fabrics is making my mouth water 🙂 Simply gorgeous. Oh such pretty fabrics and Love your dresden plate. 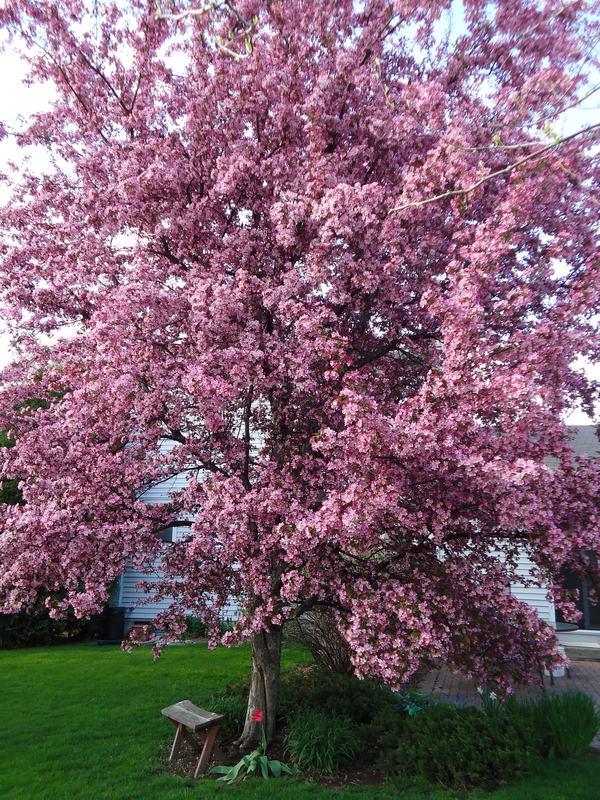 Your crab apple tree blossoms are so beautiful. The orange & lemon trees bloomed here a few weeks ago and the smell was delightful. Although if you have allergies, watch out. 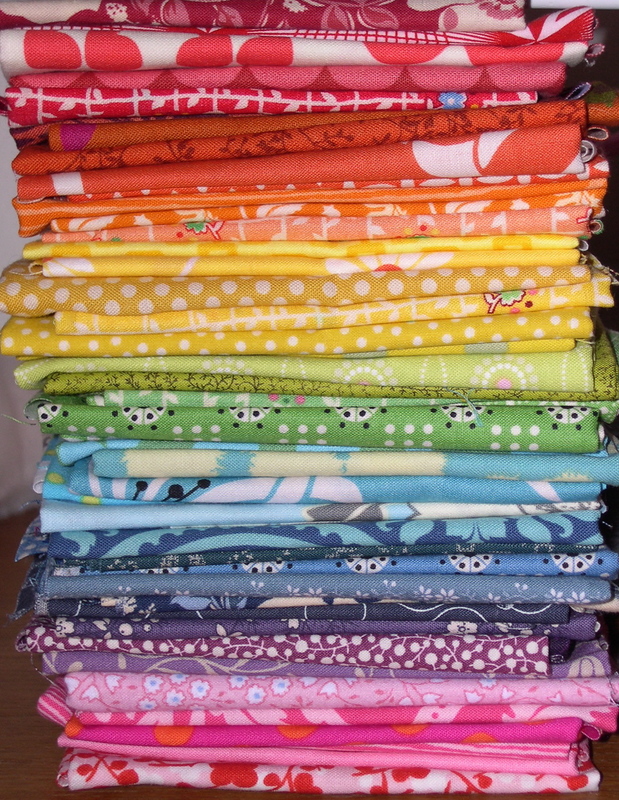 Love this stack of fabrics…and love how your dresden turned out! Terri, I love all your fabrics. I have the same book and I have wanted to make that color wheel. Your dresden plate turned out great. Your flowers are so pretty and your crab apple tree is beautiful. oh my gosh, your tulips are gorgeous! I LOVE your dresden plate color wheel. It’s so perfectly “you”. The color wheel is so cute! Thank you for sharing your lovely blog; keep up the great work, we look forward to seeing more from you in the future.